Does the chance of a cyclist being involved in a fatal accident increase as the number of cyclists on the road increases? The answer may surprise you. While the raw number of cycling fatalities does increase as the number of cyclists on the road increases, the chance that any one of those cyclists is killed is likely to decrease. This negative correlation between the number of cycling fatalities and the number of cyclists on the road is called the safety in numbers effect. 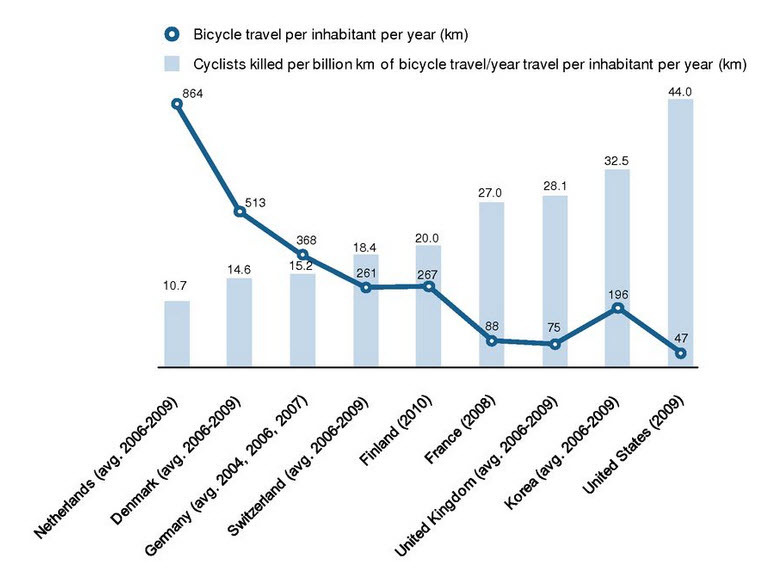 The graph above illustrates the safety in numbers effect by plotting the number of kilometers cycled per inhabitant along with the number of cycling fatalities for every billion kilometers traveled for various countries. The graph is from a research report published by the OECD (Organisation for Economic Co‑operation and Development) titled “Cycling Health and Safety.” The safety in numbers effect generally holds for pedestrians as well as cyclists. The OECD report cautions against thinking that the negative correlation seen in the graph leads to the conclusion that increasing the number of cyclists causes a decrease in the likelihood of cycling fatalities. The report also mentions that there has not been very much research into the possible causes of the safety in numbers effect and goes on to suggest several factors that may be involved. Awareness: The more cyclists there are on the road, the more drivers will be aware of them. The more aware drivers are of cyclists, the less likely they are to hit them. 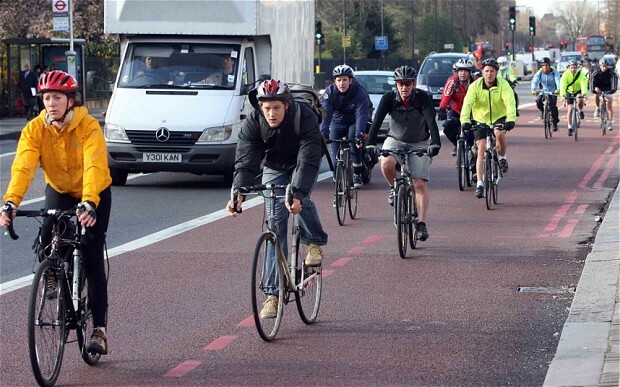 Expectancy: The more cyclists there are on the road, the more drivers expect to see cyclists. The more drivers expect to see cyclists, the more likely they are to actually see them and avoid hitting them. Collective vigilance: The more cyclists there are on the road, the more likely it is that potentially dangerous or threatening situations will be noticed by at least one of them. Those who notice potential threats will communicate this information to the other cyclists who then have a greater chance to avoid the threat. Knowledgeable leaders: The more cyclists there are on the road, the greater the chance that at least one of them will be knowledgeable about route and traffic conditions. The knowledgeable cyclist may lead the others along safer routes. It may also be the case that safety and the number of kilometers ridden are linked in a causal loop. The safer cycling is, the more people are likely to cycle, and the more people cycle, the more opportunity there is for awareness, expectancy, collective vigilance or knowledgeable leaders to have an effect in reducing fatal accidents. The Hovenring in the Netherlands is the world’s first suspension bridge designed to allow cyclists and pedestrians to safely cross a busy highway intersection. Another factor that almost certainly plays a role in both increasing the number of kilometers ridden and in reducing fatalities is the presence of a well-developed cycling infrastructure. The Netherlands, Denmark, and Germany, the three countries with the best fatalities to kilometers ridden ratios shown in the graph, also have exceptionally well developed cycling infrastructures. The Netherlands and Denmark are especially notable in this regard. The United States, on the other hand, has generally lagged behind the rest of the developed world in building well-designed and well-maintained cycling infrastructure. The better the infrastructure, the more people are likely to use it to cycle safely. There is an additional factor to consider that is highlighted by the Netherlands which has by far the lowest ratio of fatalities to kilometers traveled of any of the countries shown in the graph. In addition to having an excellent cycling infrastructure, the Netherlands has a long-established cycling culture. As early as 1911 the Netherlands had more bicycles per capita than any other European country. When privately-owned cars became more affordable after Word War II, cycling became less popular as a means of transportation. As the safety in numbers effect would lead you to expect, this was accompanied by an increase in cycling fatalities. During the 1970s widespread demonstrations took place in the Netherlands protesting the number of child cyclists who were killed on the road. 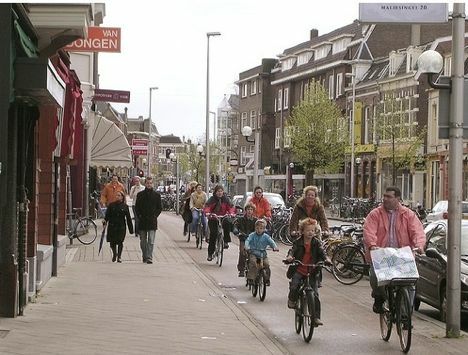 The government responded by restricting the use of motorized vehicles in cities and towns, building cycling infrastructure, and embarking on a program of safety education for both cyclists and drivers that placed the Netherlands at the forefront of countries that make serious efforts to incorporate cycling into people’s daily lives. Children in the Netherlands are taught how to cycle safely from a very young age; adults are tested on their ability to share the road with cyclists as part of the process of getting a Dutch driver’s license. According to a press release from the Netherlands Ministry of Transport, Public Works and Water Management, in 2004 the Netherlands was the only European country in which there were more bikes than people, and in 2007 26% of all trips made in the Netherlands were made by bike. As a society the Netherlands has embraced a culture of cycling and this has played an important role in producing both the very large number of kilometers traveled by bike per inhabitant and the very low number of cycling fatalities shown in the graph. Any or all of these factors – a strong social and cultural history of cycling, the presence of an excellent cycling infrastructure, driver awareness and expectation, cyclist vigilance and leadership – may have a role to play in explaining the safety in numbers effect. The negative correlation between fatalities and the number of kilometers ridden is simple and easy to see, the causal factors that produce this correlation are complex and difficult to tease apart. In 1908 when self-powered carriages finally became affordable to the general population, their operators soon took over the “ownership” of the public’s roads. Most adults soon dropped operating the almost useless pedaling machines. Most of the out-of-fashion and slow single speed bicycles were then evolved smaller into kid’s toys for sidewalk use. Most stubborn adult bike riders, except a very few professional racers, were teased as being too poor to own a car. Most adults lost interest in (slow) cycling and abandoned the obsolete and heavy one speed machines. Bikes were no longer considered useful vehicles and were bullied off the public right-of-ways. The general trend was to send a message to bike operators, trying to share the space, by forcing them off the roads with scary threats and fatal hit and run crashes as vigilante lessons. Later, from Raleigh Bicycles in England, they introduced new lightweight bikes with revolutionary multi gearing. These sport machines became available and affordable for some young adult’s new interest in Europe. This cultural bias against road riders kept happening until the late 1970’s when dedicated bicycle activist’s brave, educated, and mature voices got louder in governmental affairs. They started the Two Wheel Evolution Revolution. Yes the trend of re-vitalizing the safe and respectable operation of the bicycle is advancing. More and more of the newer generations of transportation operators have discovered the trend of using bicycles as recreation and utility vehicles. The bicycle that is smartly growing in popularity is the compact foldable bike. The laws now recognize that bicycles are respectfully permitted to again be used on the roads. The motorized vehicle’s younger operators automatically cooperate with sharing the linear travel space with the non-motorized vehicle operators. Many of the younger drivers have empathy as they may also operate bikes on the roads. They also probably know other folks who also use bikes with determination as vehicles on the right-of-ways . And the newer motor vehicle operators sympathize when seeing coordinated groups of cyclists using the roads. The culture is evolving into drivers who are Sharing the Road from the older drivers who know they must Share the Road or else.